New York City is being hit by a blizzard today!! Most people are staying in, working from home, enjoying Netflix, or binge eating!! I LOVE drinking hot comforting drinks on a cold day like this. Sometimes I make a big pot of latte and enjoy it throughout the day. My go-to drinks are usually chai or ginger lattes. Lately, I've been so addicted to black sesame lattes. The deep uniquely smoky flavor is simply addicting. Some people say it's pleasantly "bitter". Black sesame latte is rich and and more filling than a typical latte, since you leave the sesame paste in the latte. You can strain the sesame paste from the smooth latte. But I like leaving the paste in the pot so I can enjoy chewing it for a little at the end of each sip. How many times would you ever enjoy "chewing" your latte? So this is kind of a one of a kind experience. 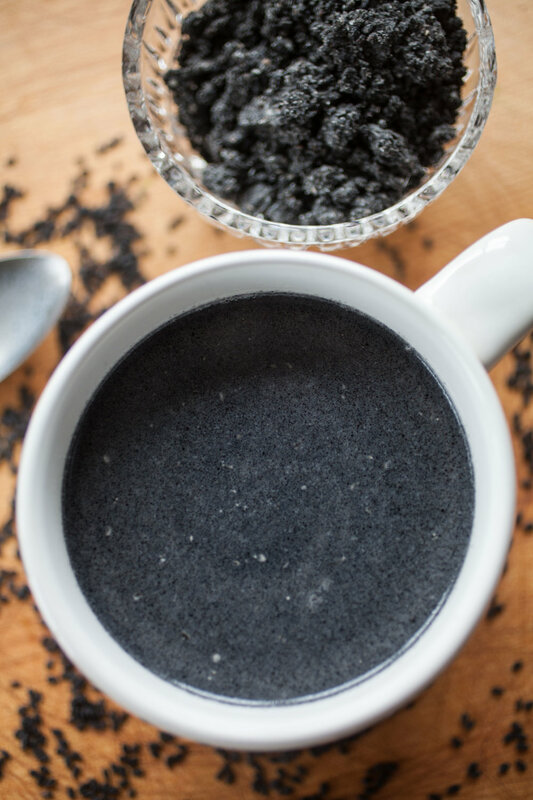 Making black sesame lattes takes some labor and love, but I promise you the outcome is worth your effort. Since you are going to toast the seeds and grind them, throw a whole cup of the seeds in a pan to toast. Then grind them in a coffee grinder all at once. After that, store them in an airtight container and keep in the refrigerator. 1. Toast the black sesame seeds in a pan at low heat for 3-5 mins, make sure you constantly stir the seeds (they get burnt easily). When they are perfectly toasted, you will hear the popping sound - very lightly. I usually toast more than I actually use so I won't have to do it again when I want to make a latte again next time. Remove the freshly toasted seeds from the pan, and grind them in a coffee grinder. 2. Add the first 3 ingredients in the pot, boil at medium heat for a few minute, stirring occasionally until it comes to a slight boil. You can skip the 1/4 cup of water if you prefer your latte thinker and super creamy. I usually simmer it a little longer at a lower heat to intensify the flavor. This way the latte won't end up too thick when adding 1/4 of water at the beginning. Note: You can add less or more sesame paste to meet your preference of how intense you want the flavor. If you want to strain the latte, you may want to add 4 tbsp of the sesame paste. 3. Add sweetener when ready to serve. Hope you all stay safe and warm.